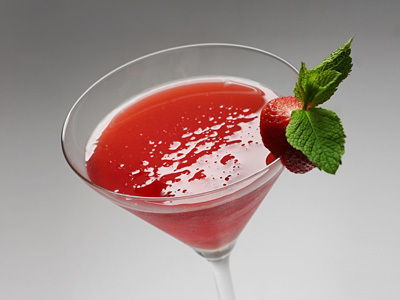 Surprise your taste buds with this strawberry martini which not only tastes like strawberry but also has a hint of spicy black pepper and refreshing mint. Amazing till its last drop! Put serving glasses to chill in freezer for half an hour or put some ice cubes in it and fill it with water. Take 6 strawberries and 1 mint sprig in cocktail shaker and muddle into squash to release their flavor and essence oils. Add vodka, simple syrup, black pepper powder and fill the remaining glass with ice cubes. Shake thoroughly. Take out the serving glass from freezer or discard the water and strain the drink from shaker into it. Garnish with remaining strawberry and mint sprig and enjoy the drink. There is also an easier version of this martini which also compares well with traditional vodka martini. Take chilled martini glass and add 1/3 oz dry vermouth and swirl it around. 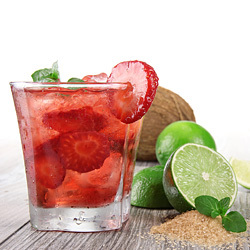 Shake 2½ oz strawberry flavored vodka and ½ oz sugar syrup with ice and strain into serving glass. Garnish with strawberry.